As we age, our vertebral discs, which serve as shock absorbers for the spine, gradually dry out, affecting their strength and resiliency. 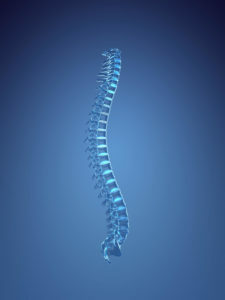 This can lead to degenerative disc disease (DDD). DDD of the cervical spine is a relatively common condition for aging adults. However, many people who have cervical degenerative disc disease don’t even know it. They may only become aware of the condition when being examined for another health problem or during a routine checkup. Disc degeneration is a normal part of aging, and is not usually a problem. However, DDD can cause the discs to lose height and to become stiff. When disc height is lost, nerve impingement, bone and joint inflammation, and resultant pain can occur. Disc degeneration causes loss of the joint space, similar to arthritis pain and inflammation. In severe cases, this pain may be constant. Diagnostic tests. Most doctors start with x-rays, which allow us to rule out other problems such as tumors and infections. 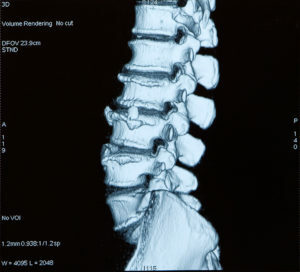 The films also allow us to see if there is any loss of disc space between the vertebrae. In some cases we also use a test called a discography to confirm the diagnosis. This test involves injecting contrast dye into the affected disc (or discs) to create a clearer image. For acute or sudden neck pain, doctors prescribe pain relief medications such as acetaminophen, anti-inflammatory agents, and muscle relaxants. Temporary bed rest or a brace may also be suggested. Usually patients are encouraged to get up and gradually increase their activities of daily living. If symptoms of cervical DDD persist despite these non-operative treatments, further diagnostic tests may be necessary. These tests may include an MRI, CT Scan, Myelogram, or possibly Discography. 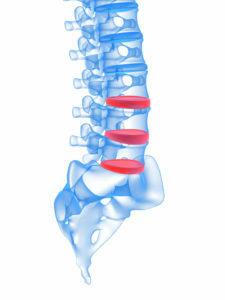 If the surgeon discovers that one or more of the vertebral discs have herniated, surgery may be necessary. Your surgeon will consider various surgical options. A common technique is an anterior cervical discectomy and fusion (ACDF). This involves an anterior (from the front) approach, removal of the offending disc and then fusion of the adjacent vertebrae usually with instrumentation. However, there are also other surgical options that will be considered, and your surgeon will carefully discuss these with you. While cervical DDD is a natural part of aging, it does not mean you have to live with neck pain. Doctors can help you return to a healthy and active life. For most patients this can be accomplished with non-surgical treatments. But even if surgery is needed, be assured that your doctor will discuss with you all aspects of the procedure and provide you with the best care possible.